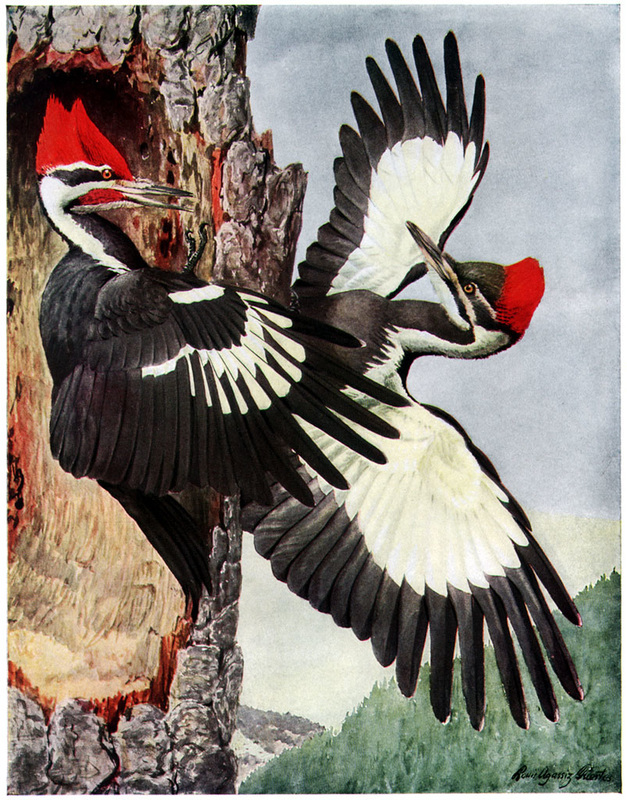 Reproduction of watercolor painting of pileated woodpeckers, by Louis Agassiz Fuertes, from "The Birds of New York" (c. 1910-1914). Boy Scout Troop 4 has played a significant role in the lives of many Cayuga Heights boys since its founding close to a hundred years ago, in 1916, by Charles Newman (see 110 The Parkway), son of developer Jared Newman. As narrated by John Marcham, (see 112 Oak Hill Road), an active member in the 1950s, Charles was inspired to found the troop when he pulled aside Lord Baden Powell, the founder of Boy Scouting, for conversation during a visit the latter made to the Delta Upsilon fraternity house at Cornell in the company of Theodore Roosevelt. In 1917, Scoutmaster Newman was called to serve in World War I and was replaced by a Cornell Heights neighbor, the renowned artist and naturalist, Louis Agassiz Fuertes (201 Wyckoff Ave.) With ready access to Cornell faculty and Fuertes as their guide, nature study became an important focus of troop activity, along with such wartime efforts as selling savings stamps, Liberty Loan Drives, and the County War Chest. Today, the troop is one of the oldest in the country. It currently meets at Cayuga Heights Elementary School.